The XC6101 XC6102 XC6103 XC6104 XC6105 XC6106 XC6107 XC6111 XC6112 XC6113 XC6114 XC6115 XC6116 XC6117 series are groups of high-precision, low current consumption voltage detectors with manual reset input function and watchdog functions incorporating CMOS process technology. The series consist of a reference voltage source, delay circuit, Comparator and output driver. With the built-in delay circuit, the XC6101 XC6102 XC6103 XC6104 XC6105 XC6106 XC6107 , XC6111 XC6112 XC6113 XC6114 XC6115 XC6116 XC6117 seriesICs do not require any external components to output signals with release delay time. Moreover, with the manual reset function, reset CAN be asserted at any time. This is one package pinout of XC6101,If you need more pinouts please download XC6101's pdf datasheet. 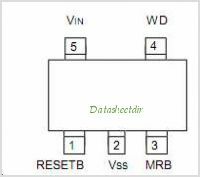 This is one application circuit of XC6101,If you need more circuits,please download XC6101's pdf datasheet.